This blog entry comes to you courtesy of Bader Consulting, mbader@montana.com, with fish art copyright Joseph Tomelleri, courtesy Montana Fish, Wildlife & Parks. 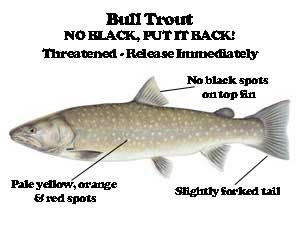 The Bull Trout (Salvelinus confluentus) is Montana's largest migratory trout and is protected as a Threatened Species. The Montana record is 26 pounds, yet even larger fish are likely. In late Summer bull trout begin epic spawning journeys up to 100 miles. They are sensitive to changes in habitat and require colder, cleaner water than other native fish. The Westslope Cutthroat Trout (Oncorhynchus clarki lewisi) is classified as a "sensitive" species in Montana. 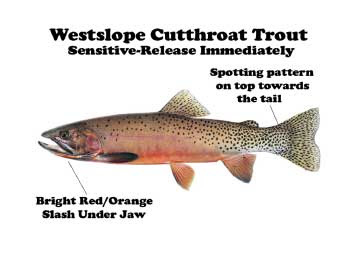 Once abundant, "pure strain" cutthroat (not inter-bred with other species) are now restricted to 5% of their former range. They are most often located in headwaters streams and high mountain lakes. The state record is 16 pounds from Red Eagle Lake. Rainbow Trout (Oncoryhnchus mykiss) are relatively abundant in Montana's cold water rivers, streams and lakes. Their name comes from the colorful stripe running the length of the body. The Montana record is 33 pounds, from the Kootenai River. 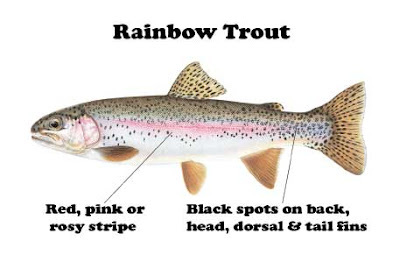 Rainbows often interbreed with cutthroat trout. The record hybrid is 33 pounds from Ashely Lake. 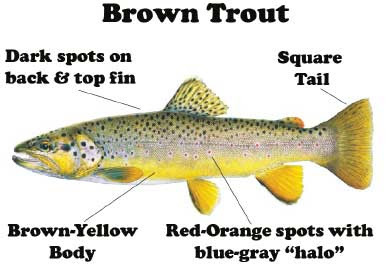 Brown Trout (Salmo trutta), also known as the German Brown, is a large trout which spawns in the fall. They take their name from the brown-yellow color of their bodies. Attaining large size, the Montana record is a 29 pound fish from Wade Lake. The Brook Trout (Salvelinus fontinalis) is a non-native fish and the smallest of the trout species. The Montana record is 9 pounds from Lower Two Medicine Lake. They are most often found in smaller tributary streams. 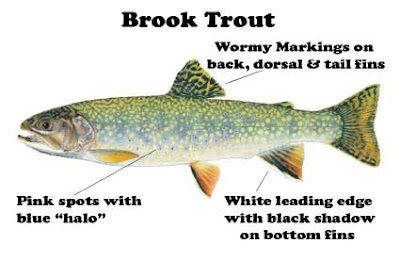 Brook trout have displaced native trout from the lower reaches of many streams. Since they are chars, they can interbreed with native bull trout, often resulting in sterile offspring. Great info on our trout! Thanks.